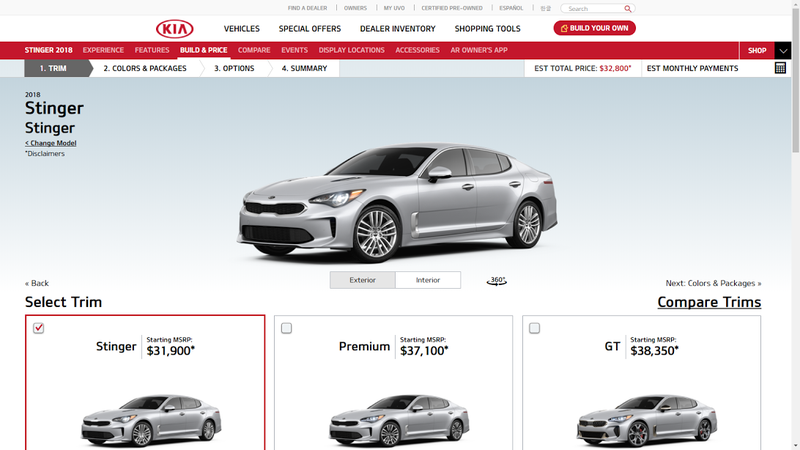 The Kia Stinger build and price is live! Ive been checking and waiting for this to go up and its up finally. Lets look at the price break down finally. I added remote start for $495. With the Drive Wise Package and remote start: $32,395, $37,495 with awd. Not bad. Next up is the Premium trim that builds on the base by adding standard things like a Harmon Kardon audio system, navigation, LED headlights, sunroof etc. It still comes with the same turbo 4. It starts at $38 grand even. Exterior color choices are the same 3 from the base but add a Blue color that Kia calls Micro Blue Pearl. The Drive Wise package is still the main option. Withe the same options as the base (remote start and Drive Wise) you’re looking at $40,495, or $42,695 with awd. It got pricey fast. Now come the GT trims after the base and Premium. There are 3: standard GT, GT1 and GT2. The GT of course comes with that sweet 3.3 liter V6 and adds Brembo’s and 19' wheels, dynamic torque vectoring control, etc. It starts at $39,250 before any options. Red becomes an exterior color choice. Adding the Drive Wise package and remote start, you’re at $$41,745. Interestingly, if you add AWD on any of the GT trims, an option package becomes available that is an all season tire package that gives you all season rubber on 18' wheels. It costs nothing, but requires that you get the Drive Wise pack. I didn’t add this. With awd, you’re at $43,945. Next GT trim is GT1 and it adds the electronically controlled suspension. It starts at $44,150. On this trim, if you select black, you can get a red leather interior. With the Drive Wise pack and remote start, $46,645, or $48,845 with awd. Lastly is the top dog GT2 trim that adds things like Nappa leather, heads up display and shift by wire. The Drive Wise package also comes standard on this trim. It starts at $50,100. Selecting the two silver exterior color choices or black will get you just one interior color option: red. Selecting blue will get you light gray leather inside. Red and white will get you Black leather. Weird. Since Drive Wise is standard, there are no options aside from the accessories. With remote start, you’re looking at $50,595 or $52,795 with awd. All in all, I think its solid and I love the amount of standard features it has, something that should sit well with the 6 people that will cross shop this with the Germans. We all know how BMW is with their options. Its not as pricey as I thought it would be because of the features, but it does climb fast between the trims. A big plus for it is the fact that awd is an option on every single trim level regardless of engine. A downside is no manual of course. The builder is live if you guys want to play with it. What do you think of the pricing and trims?